In the spring of 2012, the Gateway Building had been sitting vacant for five years. This building sat at a major entryway into Lexington, Kentucky. With such a prominent location, the city wanted to get this building fixed up, in use, and looking nice to represent their city. Ron Turner of Turner Development saw potential in the two-story 33,000 square foot (3066 square meter) building, and had the drive to take on this project. He bought the building in June of 2012 and wanted to get this project completed by September 1 of that same year. Turner had a very critical time frame if he was going to reach his goal of preparing this building for tenants before fall. “I looked around for a company to put in the retaining walls in a very reasonable time and at a fairly reasonable price. 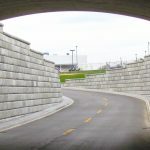 The price was important, but it wasn’t as important as getting the retaining walls in and finished on time,” said Turner. Superior Aesthetics: The aesthetics of the retaining wall were important to Turner because he had renovated the building with architectural finishes and wanted the walls to match. Turner decided to use Redi-Rock Ledgestone texture blocks to provide a more natural look to blend in better with the landscaping. “These walls just added so much more value to the building,” said Turner. “I could not have chosen a better contractor. It was a fast, hard job, but it allowed me to pick up production on my building about 10 days early. Which means a lot of money,” said Turner. Gravity Retaining Wall Blocks – Massive, one-ton Redi-Rock gravity blocks rely on the sheer mass of each block to hold back the earth. Ledgestone Texture Blocks – Redi-Rock Ledgestone blocks give projects a random, stacked stone look. © Vitco, Inc. All rights reserved.